BEIJING, June 29 -- Vice Premier Wang Qishan met with Peter Mandelson, former British Business, Innovation and Skills Secretary on Wednesday afternoon. 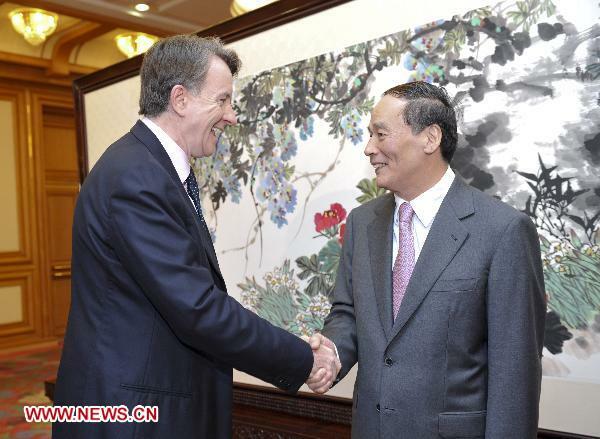 Wang hailed Mandelson' s efforts to promote healthy development of Sino-British relations. Wang said China has experienced rapid development and great changes since the reform and opening up, and the prosperity and progress of 1.3 billion people will certainly have a positive impact on the world. He pointed out that the reform of international economic regulations and standards should fully consider the actual national situation, historic and cultural factors, and development phases in different countries. Also, the reform should also properly handle relations between developed countries and emerging economies with tolerance, he added. Mandelson said Britain and China should pursue opportunities and deepen cooperation in all areas under globalization.